This wonderful pair of mahogany George II period side chairs is upholstrered in a new silk lampas similar to the 1730s bizarre silks woven in Spitalfields. The pre-Chippendale back has a simple pierced splat. The paper scrolls at the top of the styles and on the end of the the central concave tubular scroll are all the decoration the chair backs need.The cabriole legs are enriched with C scrolls below the knees. A single stretcher joins the outswept stump rear legs. 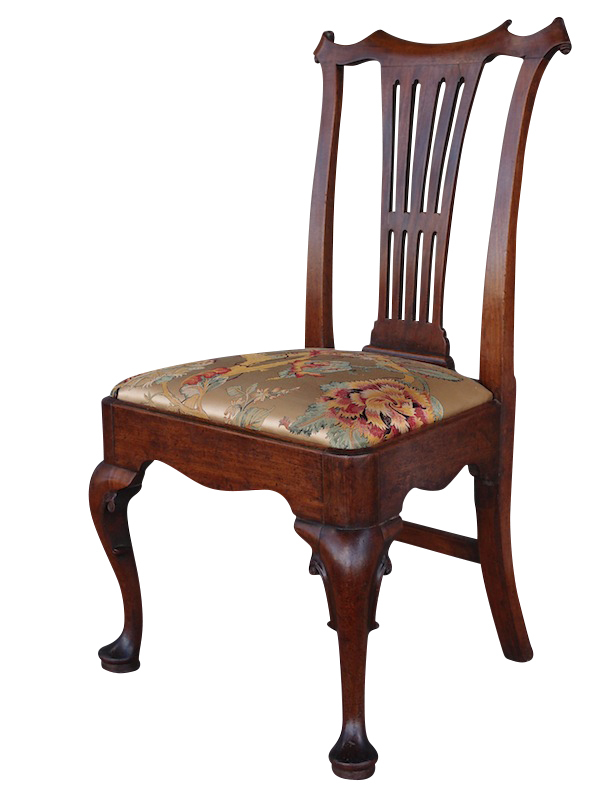 We are delighted to have such magnificent and aristocratic chairs to offer our esteemed patrons. For similar chairs see illustration 4:108 in Adam Bowett's Early Georgian Furniture 1715-1740. That chair (from a set of 24) was supplied in 1745 to Emmanuel College, Cambridge.The origin of the fan back seems to be the William Kent furniture of the 1720s and 1730s, Bowett observes, further citing three sets of such chairs, from Badminton, Ditchley and Rousham, all houses assocuated with Kent. For similar chairs see illustration 4:108 in Adam Bowett’s Early Georgian Furniture 1715-1740. That chair (from a set of 24) was supplied in 1745 to Emmanuel College, Cambridge.The origin of the fan back seems to be the William Kent furniture of the 1720s and 1730s, Bowett observes, further citing three sets of such chairs, from Badminton, Ditchley and Rousham, all houses assocuated with Kent.